Most of our customers are aware of the general process of how their aerobic system works, but are unfamiliar with what is checked and/or replaced during maintenance checks. Aerobic systems have tons of individual parts, including complex electronics — here’s a short guide to a few of the most common items that need routine checking and maintenance. This component pumps oxygen (which is needed for aerobic bacteria to grow and survive) into the aerobic tank. Many factors affect aerator pump life, but they usually last an average of 2-5 years — and sometimes can be rebuilt instead of replaced when they stop functioning. This is what filters air as it comes into the aerator. Filters can last anywhere from four months to a year, and a single filter can usually be dusted and re-used. Located at the end of the airline coming in the aerobic tank from the aerator pump, the diffuser does just what it sounds like: it diffuses the oxygen into the tank. When the diffuser becomes clogged with sludge, it does not allow the oxygen to disperse well into the aerobic tank. This can negatively affect the aerobic bacteria in the tank, which can lead to odors and sludge levels accumulating faster (the image at the top of this article is of a diffuser that needs to be replaced). Diffusers may be replaced every four months to every year. This pump is in the “pump tank” and sends treated effluent to the aerobic system’s spray heads. There are many factors that determine the life of an individual pump, but generally their lifespan can be an average of 2-5 years. The spray heads distribute treated effluent over the yard. In Texas, these spray heads are required to have purple tops (to designate that they are for wastewater). Spray heads need to be replaced if they are not popping down, not rotating, get run over with a lawn mower, etc. Note: Spray head locations and spray area are designed and permitted for specific locations — you cannot add or remove spray heads without a professional. Most aerobic systems have a source of disinfection, usually chlorine — some chlorinators accept tablets while some just use liquid bleach. Homeowners should check their chlorine supply weekly to monthly and add chlorine as needed — it should be present at all times. Don’t wait for your maintenance provider to add chlorine for you, and do not use pool chlorine in your aerobic system. Sludge levels are checked in the aerobic tank during each service check (Van Delden also checks the level in the pump tank). When high sludge accumulation occurs, the entire system (all three tanks or compartments) should be pumped. Pumping frequency depends on the system size, number of occupants, and usage on the aerobic system, although there can be other factors that may contribute to needing the system pumped out. Most systems have two alarms: an audio alarm and a visual alarm — the audio alarm usually sounds like a “buzz” or “beep,” and the visual alarm is usually a red light. If either alarm is activated, you should call your maintenance provider to have the system checked. The alarm activation could indicate something minor or major. Although it is usually not an emergency, don’t wait days or weeks to have it checked (here’s what to do if your alarm activates). Some counties in Texas allow homeowners to service their own aerobic systems. This may seem like a great way to save money, but improperly-serviced septic systems can become a health hazard. 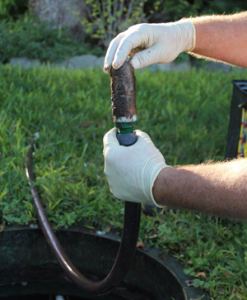 If you do not currently have a licensed, certified septic maintenance provider for your Clearstream aerobic system, consider contacting Van Delden today. ← Help! My Septic System is Flooding!